As a blogger, social media enthusiast, and general internet junkie, I spend a lot of time staring at screens. But every once in awhile, I like to get my headlines and entertainment from a tactile source, and when it comes to Nunavut news, I turn to a few trusted Northern magazines. Here, I've listed a few of my favourites, with recommended readings from each. I think this list will be especially useful for our southern readers who are looking to get more and better insight into life in the North - beyond what you get from the Finding True North universe, of course. Every time I open an issue of Up Here, I think, "What a great magazine." (Full disclosure: I write for the publication from time to time; you can read my latest article "Firing Up Yurt Fest" online.) And I'm not the only one who thinks so: Up Here was named Magazine of the Year in 2010 by the National Magazine Award Foundation. Up Here's articles primarily focus on stories and news from the three territories, though some pieces touch on other remote or northern locations in Canada. What makes this magazine so special is the breadth and variety of its pages; from award-winning photography to fiction to interviews, Up Here truly showcases the people and places of Canada's North. Recommended reading: "Inappropriation" by Samia Madwar. Madwar, one of Up Here's editors, expertly describes and condemns the appropriation of Aboriginal art and culture, from hipster headdresses to amautiit on the runway. No wonder this piece is nominated for a 2015 National Magazine Award. I had a visitor recently who told me that almost everything she knew about Nunavut and Inuit traditions, she learned from Inuktitut Magazine. Published by Inuit Tapiriit Kanatami (ITK) since 1959, Inuktitut Magazine celebrates Inuit heritage, culture, and of course, language. The quarterly is available in Inuktitut, Innuinaqtun, English, and French and includes editorials, interviews, and articles written by and about prominent community members of Inuit Nunangat. In addition, Inuktitut Magazine regularly prints archival photos and traditional legends and oral histories, bringing the past to its pages and readers. The entire collection is available for free online - easy access for anyone who wants to learn about Inuit culture, be it historical and modern. Recommended reading: "If once you fail - fight harder," an interview between Tagak Curley, founder of Inuit Tapirisat Canada (which later became ITK), and William Tagoona, first printed in the 1972 issue of Inuktitut Magazine. Scroll to page 62 of the November 2011 issue for a re-print of the original transcript, and learn about the foundation of ITK and Curley's expectations for the future of the organization. 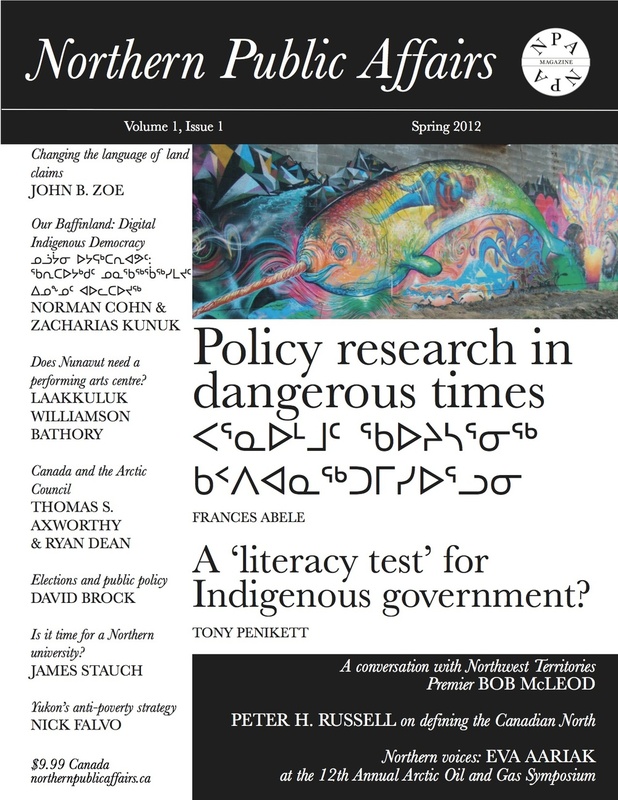 Northern Public Affairs is a relatively new magazine: it came on the scene in 2011 with a mandate "to create space for informed policy debate on the topics most relevant to Northerners." Writing for an audience of academics, researchers, politicians, and entrepreneurs, Northern Public Affairs is printed three times a year for online and paper distribution. I am routinely impressed by the caliber of its contributors - a group that includes the likes of Mary Simon, Madeleine Redfern, and Laakkuluk Williamson Bathory - and the depth of analysis and reflection they achieve. Due to the subject matter and intended readership of the periodical, the writing and style of Northern Public Affairs can be a bit dense; the ideas presented, however, are worth investing the time and effort required for understanding. Recommended reading: "Strengthening the voices of Northerners in Arctic science" by Joshua Gladstone and Sheena Kennedy Dalseg. This Letter from the Editors discusses the challenges of Arctic research, namely, how to balance scientific or study priorities with community engagement and Indigenous knowledge. In doing so, the authors touch on some tricky and sensitive subjects, including the "legacy of researchers extracting information from Indigenous communities through exploitative practices" and the inherent power imbalances between researcher and subject. 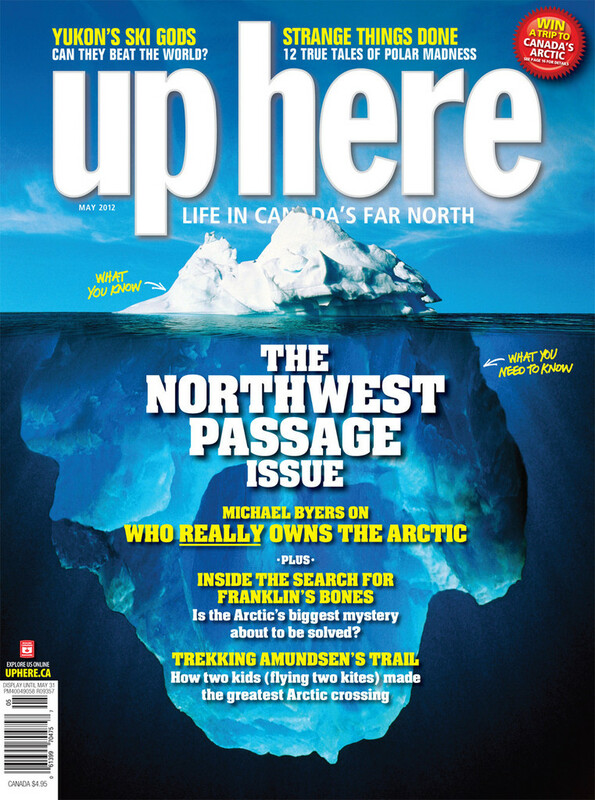 The official in-flight of First Air, above&beyondcovers lifestyle, news, and travel features about Canada's North. Each issue includes work from some very talented folks, like photographs from Michelle Valberg and regular commentary by current ITK president Terry Audla (check out his piece on internet access in Nunavut). above&beyond was the very first Northern magazine I ever read, on the flight from Montreal to Iqaluit that marked the beginning of my life in Iqaluit. I remember scribbling down names and places and holidays as I thumbed through the pages, such that by the time I landed, I felt a sense of understanding and connection with the place I would soon call home. Recommended reading: "Nancy Columbia: Inuit star of stage, screen and camera" by Kenn Harper (another prominent Arctic historian). Born in 1893, Nancy Columbia was the most famous and most photographed Inuk of her time. As Harper chronicles the life and times of Columbia, he brings us back to an era of public prejudice - a time when ethnic stereotyping, human zoos, and descriptors like "Mongolian eyes" were the norm - to illustrate the struggles faced by Columbia (and arguably, still experienced by Aboriginals and other people of colour today). Nipiit Magazine is written and published by the National Inuit Youth Council twice a year. The goal of the publication is to better connect Inuit youth across the country, and to that affect, the majority of articles are submitted by youth. Nipiit's issues include a Health Column, a Language Column, photo essays, arts entries, and more. I was referred to Nipiit by Miali Coley, a local educator, and found it super useful when writing curricula or educational pieces on subjects like suicide, bullying, and colonization, all of which Nipiit has covered with sensitivity and insight. Leave it to the kids to tackle the topics that leave adults befuddled. Recommended reading:"Dear Mr. Government" by Suzy Jeannie Kauki. This poem depicts the disconnect between the government and Inuit over time, from misunderstandings to mistakes, and the lasting impacts on society today. And yeah, you read that right - it's a poem. Which Northern magazines do you read or subscribe to? Let us know if we've missed anything in the comments or on Facebook!